The name captures the uniqueness of honors education at Ohio University: Honors Tutorial College. The college has 203 professors, called “tutors,” who work with about 240 honors tutorial students either in very small groups or one-on-one. 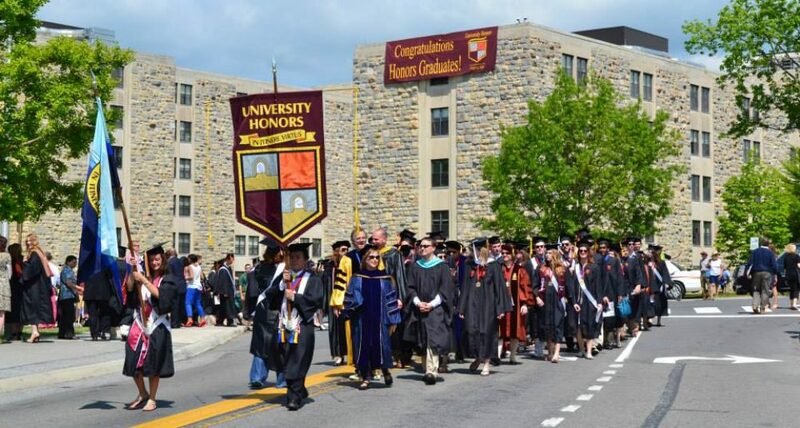 The college is one of the fifteen additional public university honors programs that we hope to include in the 2014 edition of our Review . The programs are offered at the following universities: Colorado State, Florida State, George Mason, Kansas State, Kentucky, LSU, Miami of Ohio, Ohio University, Oklahoma, Oklahoma State, Oregon State, Temple,Tennessee, UC Riverside, and Utah. For anyone who may associate the word “tutor” with those persons who assist struggling students, it is time to banish that conception from your mind. The students at the HTC are not there to catch up but to leap farther ahead. Students at the honors college–officially called “tutees”– can choose from among 32 courses of study, and each discipline has a director of studies, a full-time professor in the chosen department who coordinates honors tutorials. “The Honors Tutorial College (HTC) is based on the centuries old tutorial system of undergraduate education developed at Oxford and Cambridge universities in Great Britain. Ohio University is the only institution in the United States with a degree-granting college incorporating all the essential features of the traditional tutorial system. “Tutees gain important fundamental knowledge, hone essential skills, and begin to develop an understanding of what inspires them. The tutorial process puts the student at center stage, with a great responsibility for showing creativity, initiative, persistence, and precision. They must learn not only the material at hand but also the minds and habits of their tutors, a process which requires the sort of creative anticipation and planning that is the frequent task of accomplished people in their careers. Students must meet with tutors at least once a week for a minimum of 50 minutes. But do not think that this makes the tutorial classes easier. The preparation and planning necessary for each meeting can be daunting. Discussing research papers with tutors is a major part of the work, placing a high premium on the ability to organize and articulate reasoned positions. In the lab context, students work directly with research scientists and lab supervisors, often on projects that have immediate impact. One such student was Nyssa Adams, a recent graduate of the HTC, and now a student in the combined MD/Ph.D program at the Baylor University School of Medicine, one of the nation’s top medical schools. While at the HTC, Nyssa began working on research to improve cancer drugs used to fight ovarian cancer. Working so closely with professors gives students interested in science multiple opportunities “to find your lab” and “dig into research,” Nyssa says. Her own digging made her one of the outstanding undergrad researchers at HTC, and a student/scholar with the confidence and ability to earn the two doctorates she is seeking. The HTC offers its own degrees, including degrees in business, fine arts, and journalism. The curriculum, while flexible and reliant on individual choices, typically turns out to be extensive and demanding: most students finish with approximately 200 quarter hours, of which about 48 are in tutorials or seminars. The minimum admission requirements for the HTC are ACT/30, SAT/1300/GPA top 10%. The actual averages for HTC admits is SAT verbal 683, quantitative 664, for a total of 1347. Unlike many honors programs, the HTC makes most of the information about the college readily available on the web site. HTC students have the option to live in the Read-Johnson Scholars Complex on the East Green of the campus, an air-conditioned central location with dining and laundry facilities nearby. One excellent feature is a sink in each room. Students may also live in Hoover Hall on the South Green, perhaps not as centrally located but still a great option if students prefer “mod” room arrangements–a combination of single and double rooms with a central living area, all shared by six students. This entry was posted in Honors Curriculum, Honors News, Honors Research, Honors Residence Halls, Types of Honors Programs, Uncategorized and tagged Nyssa Adams, Ohio University Honors Tutorial College, Ohio University Honors Tutorial College unique creative productive, public university press by Honorsadmin. Bookmark the permalink.